A beautiful vintage 9kt (English) yellow gold ring with 1 round facetted cut light intense yellow citrine, est. 1.59ct and 8 white seed pearls, approx. 3.9-4.00mm. 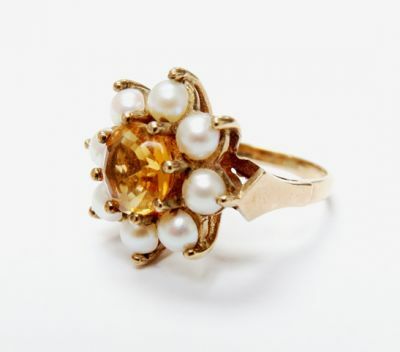 Citrines are one of November's birthstone rings and believed to have healing properties.